A beer friend of mine from Twitter recently sent me this review of a cool beer and brewery from Oklahoma City! Like the HughesNet chick on TV says, "How Cool Is That?" I had the immense fortune of living most of my life in Upstate NY near Vermont where craft beer is intricately imbued into the culture and I thrived. Upon receiving the news that we were being relocated to Oklahoma, I was terrified for Oklahoma is a state where many prohibition laws still exist. To my gleeful surprise, I couldn’t have misjudged Oklahoma more. Oklahoma City’s craft beerscene is on the rise with stars like RoughTail Brewing Co. shining brightly. I accidently discovered RoughTail Brewing Co. through a Groupon for their Brewery tour and I must admit that I was more than a little skeptical. 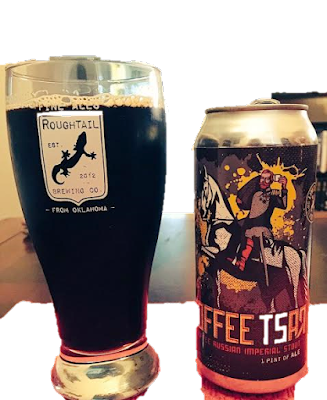 However, after my first sip of the RoughTail Coffee Tsar all my doubts were quickly banished and I was eager to sample more. To this day, it’s still one of my favorite beers and not just because it’s the beer that welcomed me to Oklahoma. RoughTail Coffee Tsar is a Russian Imperial Stout that boasts of a 10.30% ABV. It’s not one for the feint hearted as its rich dark color, coffee aromas and full bodied nature are quite evident from the heavy pour and first sip. On your second or third sip, you’ll be amazed how the malt presence complements the chocolate and vanilla flavors to achieve the perfect balance of sweet, bitter and savory. In the background, you’ll notice a faint hop that keeps the richness of the beer from over-saturating your system. Be careful! Despite its high ABV, it drinks extremely smooth, rapidly resulting in an empty glass that leaves you yearning another. For those of you visiting Oklahoma, be sure to keep an eye out for this majestic treat!